Studienarbeit aus dem Jahr 2013 im Fachbereich BWL - Unternehmensführung, Management, Organisation, Note: 1,0, Christian-Albrechts-Universität Kiel (Applied economics of the firm), Veranstaltung: Risk and Entrepreneurship, Sprache: Deutsch, Abstract: Friday, the 19th of October, 2012, the German newspaper 'Handelsblatt' (Storbeck, 2012) titled: 'Rethinking Economy'. 15 young economists were introduced to be the new hope for economic science. One of them was Ulrike Malmendier whose first economic researches deal with managerial hubris. Introducing her is proofing the importance of a new economic domain called 'behavioural economics'. As a behavioural economist Malmendier criticises the 'homo-economicus'-model and the idea of people acting entirely rational. In fact, people constantly display irrational behaviour that results out of cognitive biases (that distort their perception) and also results out of simple, but biased decision rules (heuristics) that the human mind implies. One of those cognitive biases is that people seem to be unreasonable overconfident. The study of overconfidence is originated in the psychological literature. Because of it's great impact on the behaviour of economic actors, it recently influences economic and finance literature (Benoît, Dubra, 2011) and significantly shapes the research activity in behavioural economics. The task of this essay is to critically analyse the role of overconfidence in a special economic domain: business entry decisions. The text is structured as follows: The first section shortly deals with the domain of business entry failures. In the subsequent chapters, overconfidence is introduced as a possible explanation. It is to explain what overconfidence is and how it arises. 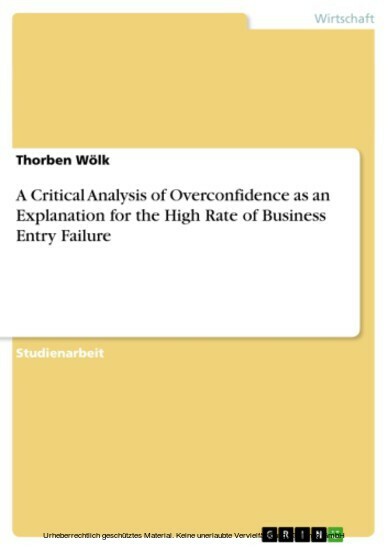 The text then reviews the paper of Camerer and Lovallo (1999) and critically analyses overconfidence as an explanation for excess entry and high rates of business failure. At last, it will take a further look at the future research tasks.